Dargaud is a famous publisher of Franco-Belgian comics series. 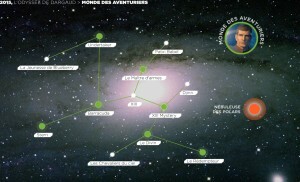 In this greeting card project, they introduce their comic strip classified by themes simulating a constellation. The project was made using Pixi.js, GreenSock’s TweenMax library and Signals. I felt right at home! // Create a Student.prototype object that inherits from Person.prototype. Autocompletion you said? Well, with recent IDEs you shouldn’t have any issues. For this small project, I give a try to NetBeans, a free IDE. I was ok with its features, but how may a simple project with 5 files in html/js eat so much memory? That’s crazy! The next time, I will stay with WebStorm. Note that it will also works for a simple circle! This project was also an opportunity to give a try to the remote IE. Finally Microsoft gave us a simple way to test on IE and it works nicely!